“Old Time square dancing is a great way to have fun with friends, meet new people, and entertain a party. No experience is required; all dances are taught, and dances are chosen to suit the age, experience and tastes of the dancers. 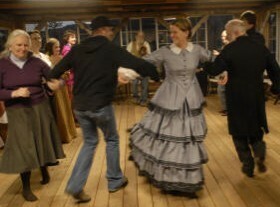 Unlike Modern Western Square Dancing, traditional square dancing (and circle dancing, reels and partner dancing) doesn’t have clubs, costumes or rules. If you’re having fun, you’re doing it right.” — Zach Hudson. I couldn’t say it as well myself. I don’t know how many dances I’ve called. Hundreds. The first was a disaster, but not one I started. I was fiddling at the County Fair in New Castle Virginia one summer day. There was to be a dance at 2 pm, but the band and caller didn’t show up. People were there and wanted dance. I was recruited to fiddle, there was a banjo and a caller, so off we started — only one major problem: the caller was drunk. He called Swing Yr Partner three times in a row and disappeared (head first off the end of the stage). So I stepped to the mike, “Promenade! Swing Yr Partner!” I wasn’t much better, but I didn’t disappear. After that I took a cassette player to every dance we attended along the VA-WVa border, and later studied the rhythm & wrote out the dances. Just in case. I called a few in and around Duluth when we stopped there for a couple of years on the way here, and they went well. The first summer here (1981?) I was recruited for a folk festival at Mission Mill in Salem. Halfway through my set I said, “Anybody for a square dance?”, set up two or three squares, got two or three musicians to run up with their guitars, and off we went. I started calling a monthly series in Dallas OR, and occasional ones for the Salem Folklore Society. I zipped right over. The caller had a third of the kids standing in the corner for misbehaving. “I can do better than that!” I was soon signed up for “Artist in Schools” programs — eventually to 40 different elementary schools, for a week or two weeks depending on the size of the school. First an all-school assembly, where I’d explain old time music and play a tune each on fiddle, guitar, banjo, dulcimer, and mandolin. Then off to meet each class one at a time, three meets before the final assembly. Each student learned five different dances, types. For the assembly the six grades would show off different dances they’d learned. I learned too. Several schools called me back on their own in following years, after the Artist in Schools programs fizzled out. I was impressed with a school in Oregon City that had me teach three years in a row; four years later their girls’ basketball team were state champs three years in a row! Today teachers are too loaded with test stuff. Somewhere along the line I took a dance-calling workshop with Sandy Bradley. It was good – the two things I remember: 1) Have Courage! 2) Get there early enough check out the room: you may have to sweep the whole thing with a dust mop before everyone else arrives. I’ve done it. Many adult or mixed dances since: monthly series, folklore societies, weddings, parties, NW Folklife, barn dances at Champoeg Park and other working barns, etc. . Sometimes impromptu and unexpected. Have called with various kinds of bands; old time, bluegrass, polka. Most in Oregon, a few in Washington, one in California, those early few in Minn and Wisc. Biggest was 24 squares, at a teacher’s convention in Seaside; just three dances, me and Wes for music, but it was fun. Lots of small dances with groups that didn’t normally dance, several times with just myself and Wes for the band, or myself and Tim Crosby, many times with larger groups. Sometimes a mixed evening: concert + dance + singalong. Either of those guys can carry the music just fine solo — but the trio would be first choice. I did one whole evening solo, 2+ hours, at the Newell House at Champoeg, when they were celebrating a 150th anniversary and wanted it authentic. It was, and it was fun! Al LePage tried to get me to go to Boston and do the same thing solo, for a Charles Dickens promotion, but he couldn’t twist my arm that much. We got Dudley Lauffman to take it on, he lives closer. I can do a long evening without cheat cards, and when doing a series, like the current series at Guthrie Park, try to introduce a new dance each month. I like a big loose dance, with a lot of variety, and may throw in extra little dances, from Little Johnny Brown to the Heel and Toe Polka, etc. My favorite music for dances is the old-time Appalachian sound of fiddle, banjo, and guitar. Feb 15 – Guthrie Park, Dallas, with Cash & Co.
May 24 – annual concert dance for Deaf School in Monmouth, Wes and I only!